Even before photography was invented, advertisements were used in the press as illustrations to capture readers’ attention. In the digital world, the distance between the image / ad and our online store is less than a couple of clicks away. Let’s find out how we can make the most of the impact of visual marketing to transform images into clicks and clicks into sales. Alright, let’s get the cliché over with: a picture is worth a thousand words. As much as this phrase is used, it’s still true, especially when we’re talking about marketing. Imagine that you’re looking online for a restaurant to have dinner. You see one that you’ve been recommended but it doesn’t show any pictures of the dishes. You see another for traditional food with good options but the photos are unappetizing. A third shows images of their dishes with good lighting, careful staging, and photos of customers enjoying their food. Which one would you go to? The same strategy translates to practically any type of business, even more so when we talk about an online store where images play an essential role in the decision to make apurchase. How can you take advantage of this perk so that potential customers enter your online store? You see a sign that says “Exit” accompanied by a horizontal line with two other lines at a 45º angle that converge at the left end. Yes, that’s it: an arrow. You’ve probably never been taught that this image indicates how to find the exit, but you know because it’s ‘logical’. We move using visual stimuli, and are able to easily understand graphic representations. The instinct that tells you where the exit is is the same one that tells you if a dish isappetizing or not. Taking advantage of the visual impact of photography is necessary to making your customers want to enter your online store, browse through it, and finally, makea purchase. A large part of your online store’s traffic will surely come through search engines. When indexing your website on Google, you usually have the SEO of your website’s texts visible. But more and more, search engines focus their efforts on positioning the images. 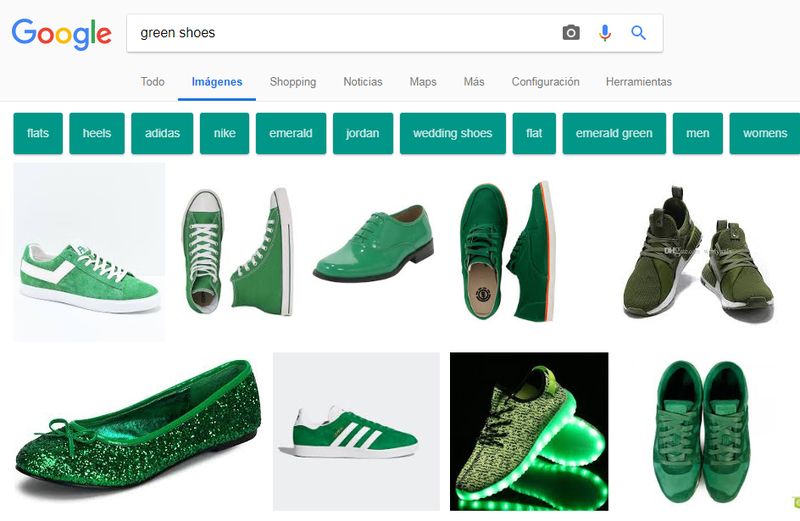 Until artificial intelligence stops working at 100%, it’s your responsibility to correctly tag your online store’s images so they’re positioned like they should beand stand out in the sea of Google Images photos. When we talk about image SEO, we can’t forget about videos. If your online store has a YouTube channel or something similar, don’t forget to optimize your videos to upload posts in the searches. Remember to include calls to action and links for your audience to visit your online store! Instagram has more than 800 million active users per month. Facebook has over 2 billion. You’d expect at least a few of those users come to your website, right? When we talk about visual marketing, social networks are the best weapon you have to captivate your target audience. Don’t settle for showing photos that get a few likes, publish photos that your audience wants to share and comment on. Remember, when we deal with an image, quality should always come before quantity. You don’t need to have all the photos on your profile to be of products, though that’s not bad either. 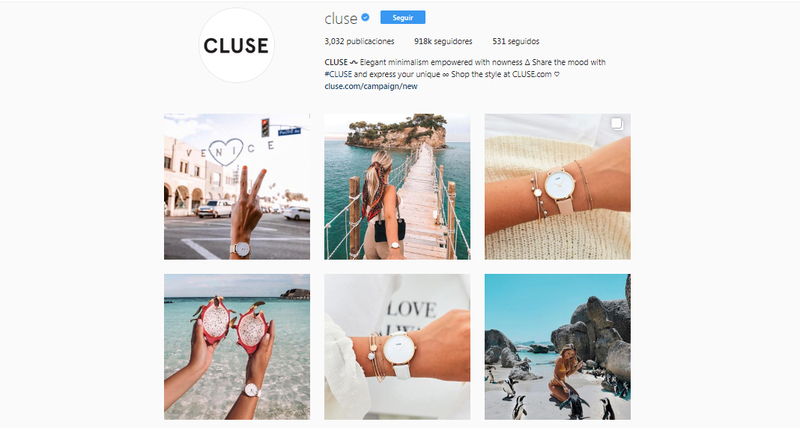 But, if you decide to share parallel content, make sure the image is always well-focused, well-lit and that the feed setting is consistent, like we see on CLUSE’s Instagram. Just a tip: when in doubt, throw it out. There are as many body types as there are people. Seeing an article of clothing on someone with a similar body size as you can help you imagine how it would fit you. Take advantage, in the best possible sense of the word, and share photos of fans, not just models, using your product. Tools like Photoslurp will be useful to share photos everywhere of your customers using your products: social networks, website, product sheets, etc. By doing this, you’ll kill two birds with one stone: you’ll ensure that your public identifies with your brand and is more willing to enter and make a purchase inyour online store;and you can also boast having a solid fan base for your brand. Influencer marketing has grown exponentially in recent years, and there’s good reason for it. Seeing familiar faces using a certain product makes us immediately identify with the brand, even if it’s subconsciously. If you’re launching an online store, you can start with what are known as micro-influencers: influential people in a small niche who have a lot of influence among their fans, though a lower volume of followers than celebrities. Going back to the previous point, what better influence than the familiar face of someone in your sector? Encourage your followers to share photos showing off your products; it’ll reach their immediate circle who, in turn, will be more inclined to check out your brand and browse your online store. If you had a physical store, surely you wouldn’t let customers get to the door and just turn around, right? Well, it’s the same with your website: attracting traffic to your online store is only the first step towards making a sale.When the customer arrives, it’s vital that they like what they see and decide to make a purchase and we’re not only referring to the product, the design of the store and the tools you have at your disposal are important too. With a tool like Oct8ne, you can show your product and explain it to your customers in detail, answering questions in real-time and making sure they have all the information they need to buy it. Furthermore, they’ll feel more confident making the decision to buy something and probably want to return to the online store next time thanks to feeling guided during the purchasing process. As you can see, the impact of visual marketing is key to getting traffic to your online store. Now it’s your responsibility to take advantage of its full potential, starting with your customer’s first visual contact with your brand and continuing after the sale, when they share photos of your products on social networks. Start the engine, throw on (visual) firewood regularly, and enjoy the natural projection of sales in your online store.